As I do from time to time, I joined a group of Malacky cyclists my father is a member of for a cycle trip. 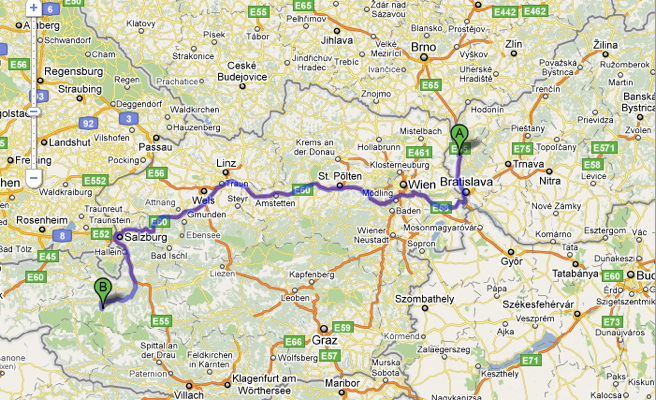 We departed on Wednesday at 5 am in the morning from Malacky to Fusch in Austria. 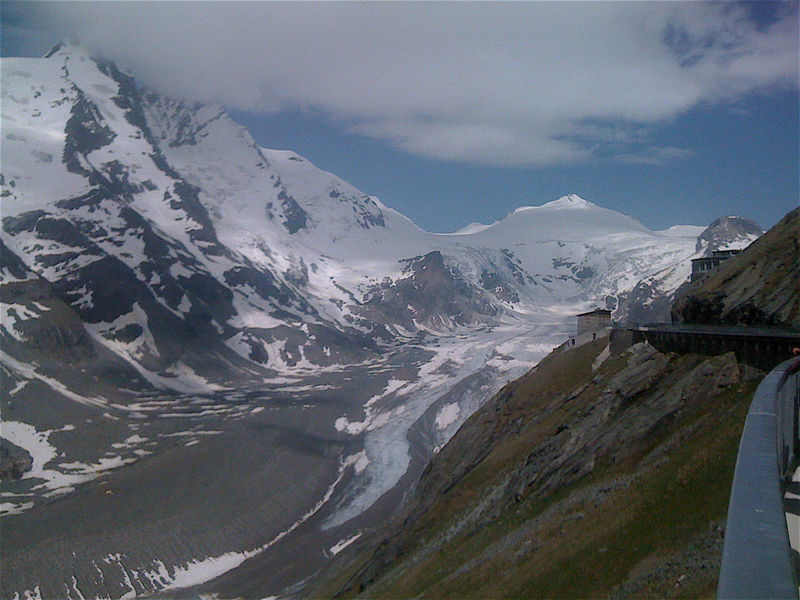 This small village is on the Grossglockner Hochalpenstrasse road leading to the heart of Hohe Tauern national park – the Kaiser Franz Josef Hohe (KFJH). 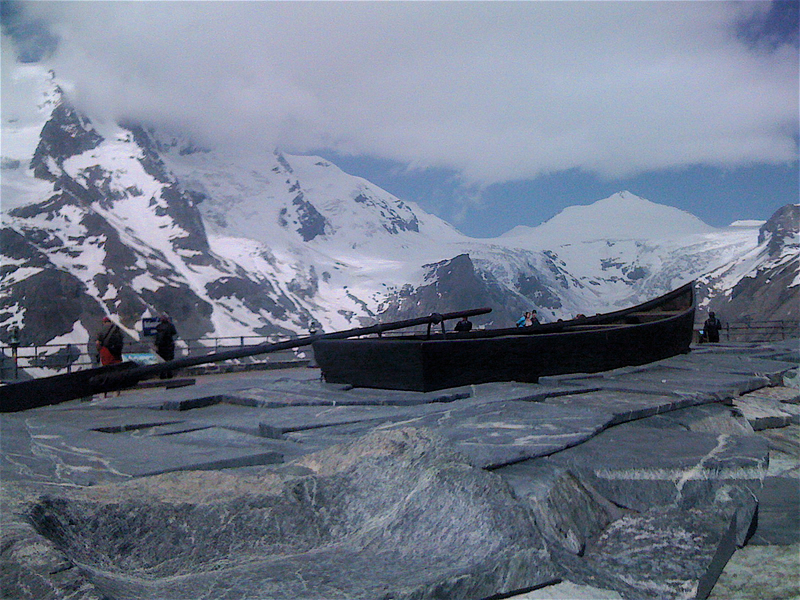 KFJH is place built on the edge of the longest glacier in the eastern Alps, the Pasterze, which is originating at the foot of Austria’s highest mountain, the Grossglockner (3,798m). 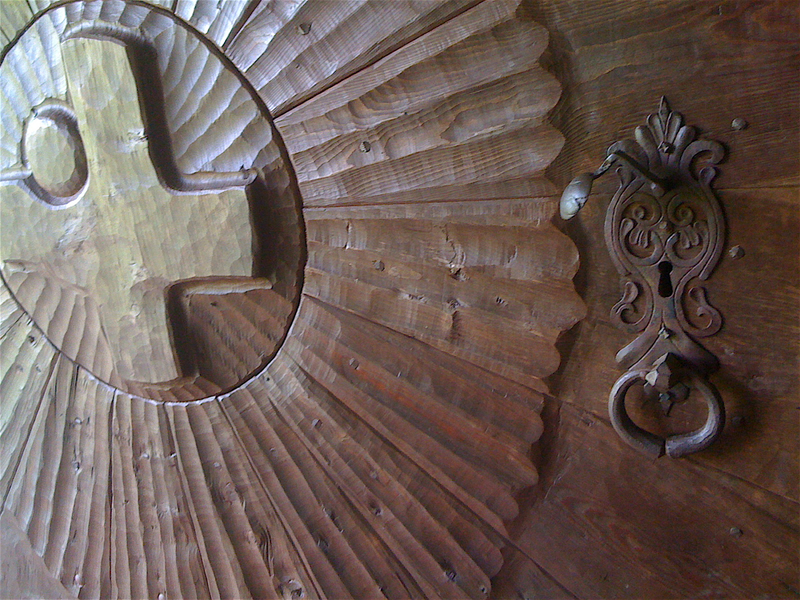 Upon arrival to Fusch we easily found accommodation in a pension right on the village edge – the Schösser/Schnabler pension. There are actually two pensions owned by the same family. At the time we were there, the fees were very reasonable – 16 € and that includes also breakfast. In one of the building is available also free wireless internet, but there is only one access point, which limits coverage to just a couple of rooms. Afternoon the same day we made a short biking trip to Zell am See – a tourist town on the edge of Zeller lake. The weather was great with air temperature it the 80-ies so many people were sunbathing on the lake edge and swimming in it. My colleagues followed the road around the lake back to the pension. I extended the trip to a village Saalbach (apparently a downhill skying destination) in a side valley about 16 km from Zee. There I turned back and also returned to the pension. The forecast for Thursday indicated weather without rain so I decided to ride the hochalpenstrasse all the way to Franz Josef Hohe. 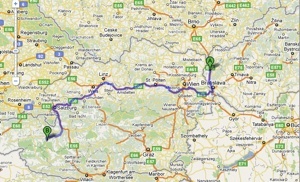 The distance there and back is only about 80 km, but the elevation gain is more than 3 km. That – and the fact that the road is reaching quite a respectable altitude of around 2,500 m above the sea level – was promising the trip to be a great adventure. A colleague (Marian) and I departed around 7:30 am. There is a toll gate about 5 km from the village (cyclists do not pay the toll) where we made a short break. 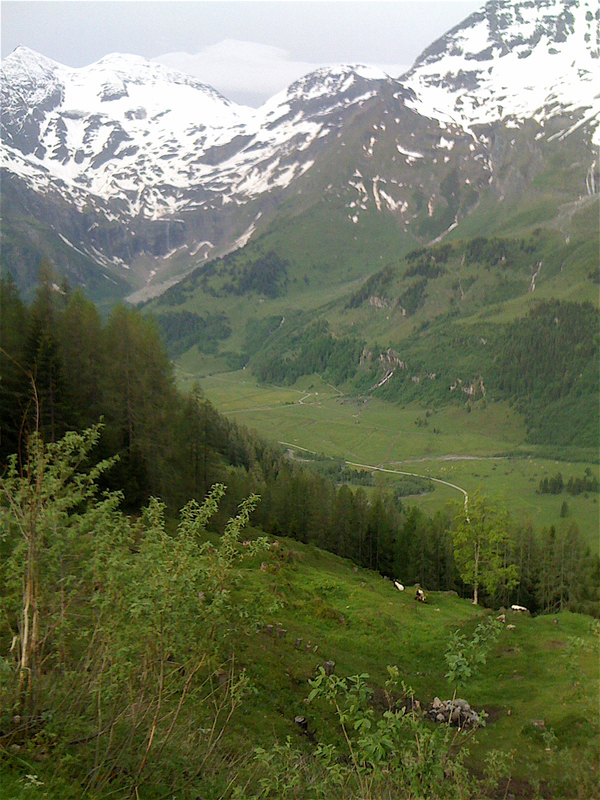 The road from this point to the Fuscher Torl gains about 1000 m in elevation following switchbacks – first through a nice evergreen forest, later through a treeless alpine environment. The views are spectacular – see pics below. Unfortunately once we left the forest the wind picked up to the point where the sudden gusts were making any advance very difficult and dangerous as there was threat to be blown off the road or into a path of an incoming vehicle. It was Thursday and we departed quite early, so there was not that much traffic (the toll gate is open for motor vehicles at 8 am) which made it possible to keep to the inner edge of the road. I reached the pass about 1 hour before Marian and managed to get quite cold as I was standing outside watching for his arrival. When he made it to the top he decided to have a break and head back to the pension. I wanted to continue, but after biking about 100 meters up to a curve in the road I realized the wind gusts got so powerful as to make the trip life threatening if I were to continue so I returned back. The outside air temperature itself was pretty pleasant, but the wind was strong enough to lower it to the point where warm liquid was desired, so we went into a restaurant to get coffee and tea. After the refreshment we descended very carefully and with great effort back to the valley. 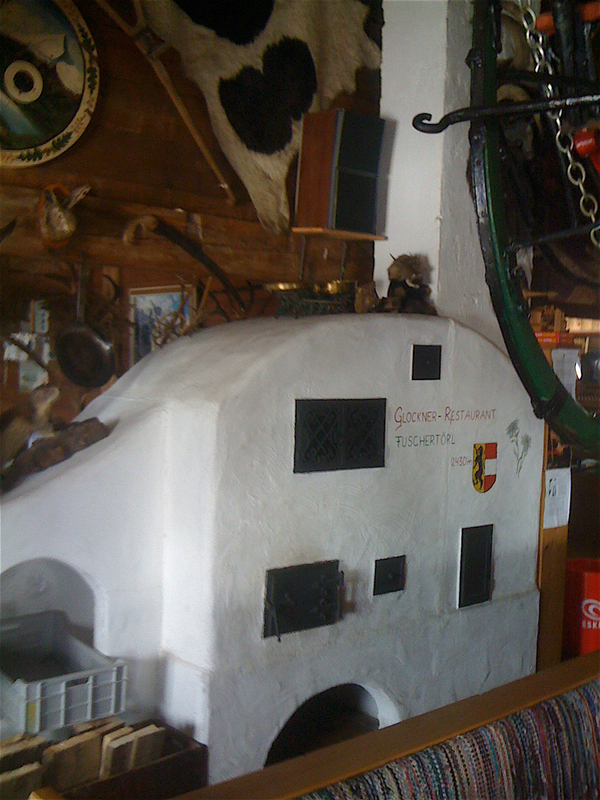 As the “day was young” we rode to a side valley to check the Bad Fusch – a former spa place about 4 km from Fusch . Up the valley to the Fuscher Torl. 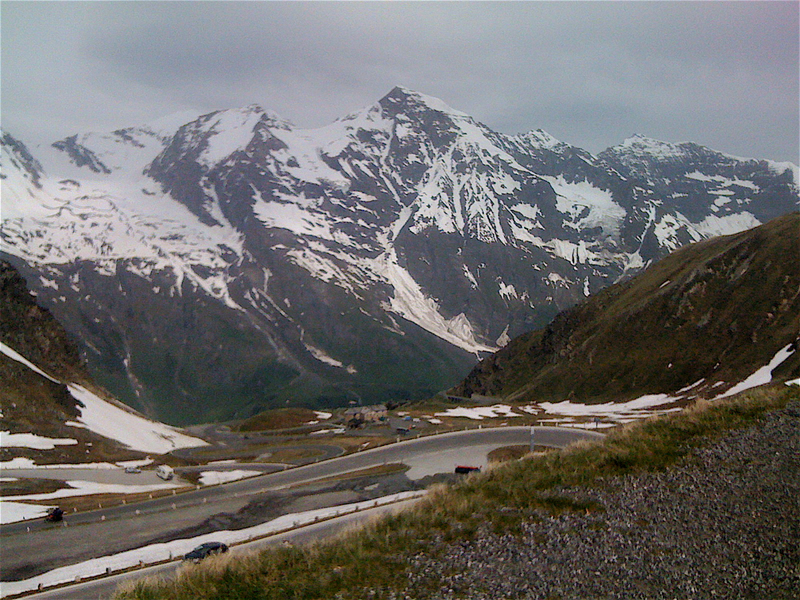 View down the Fusch valley and the road that lead us up to the pass. Heading back down the valley. 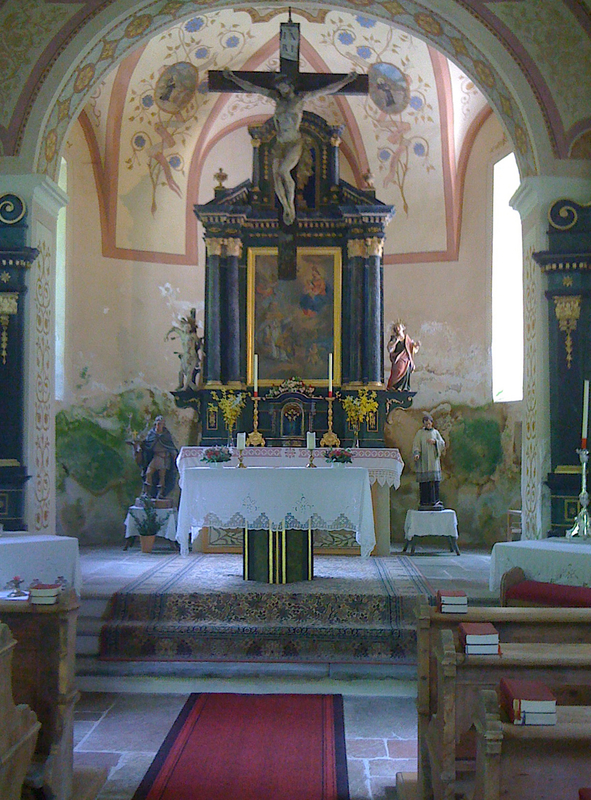 Small chapel in Bad Fusch next to the spring used in the spa. 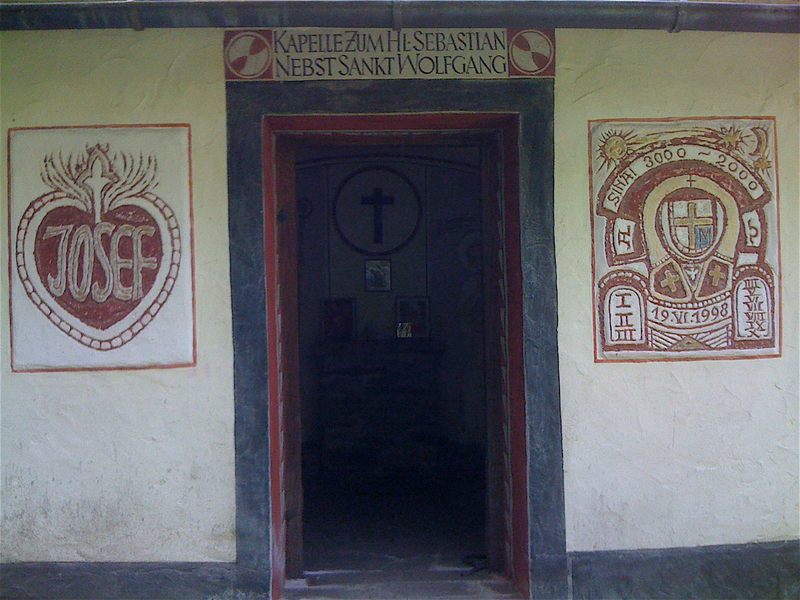 An entrance door detail and interior of a small church in the spa hamlet. A great cycle way leads through the valley. 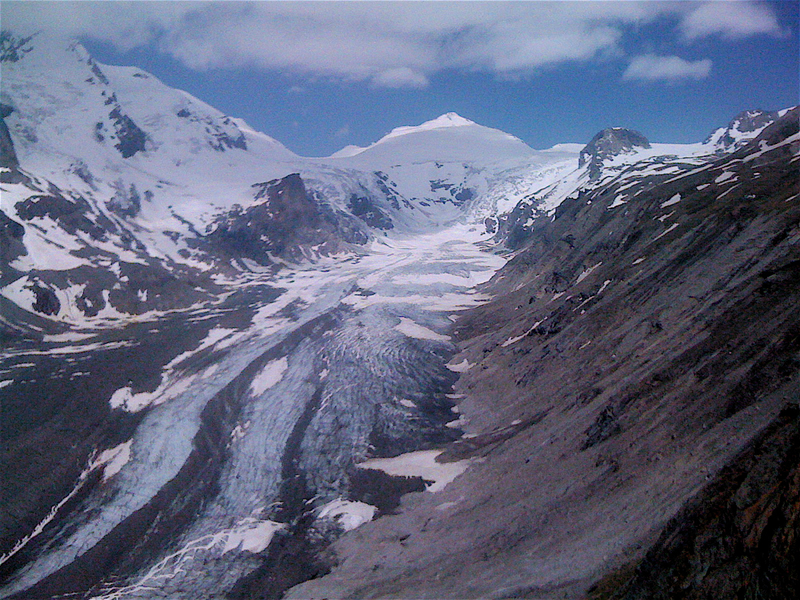 On Friday our whole group made a 140 km trip to the site of the highest waterfalls in Europe – the Krimml Waterfalls. 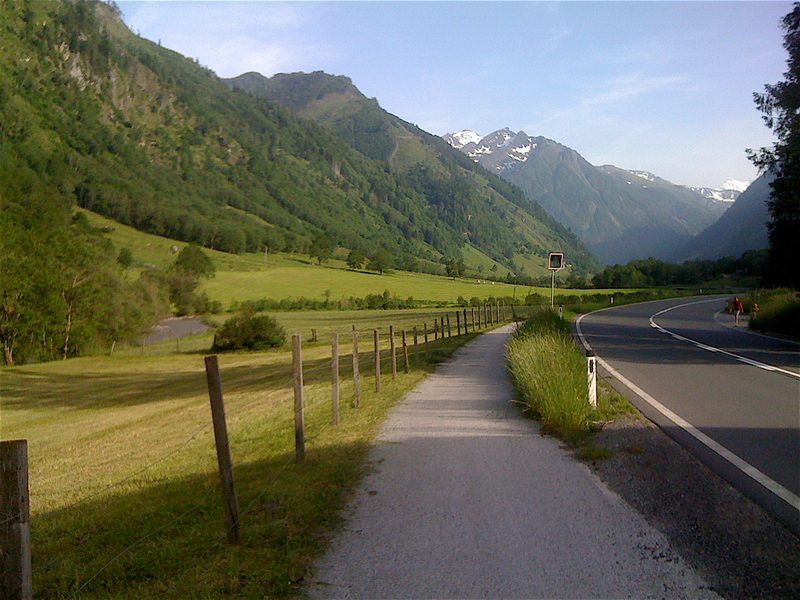 We took the Tauern cycle path leading along the lovely Salzach River valley. The path is mostly asphalt-paved and generally well-marked, leading through farm land and small, well kept towns along the valley. 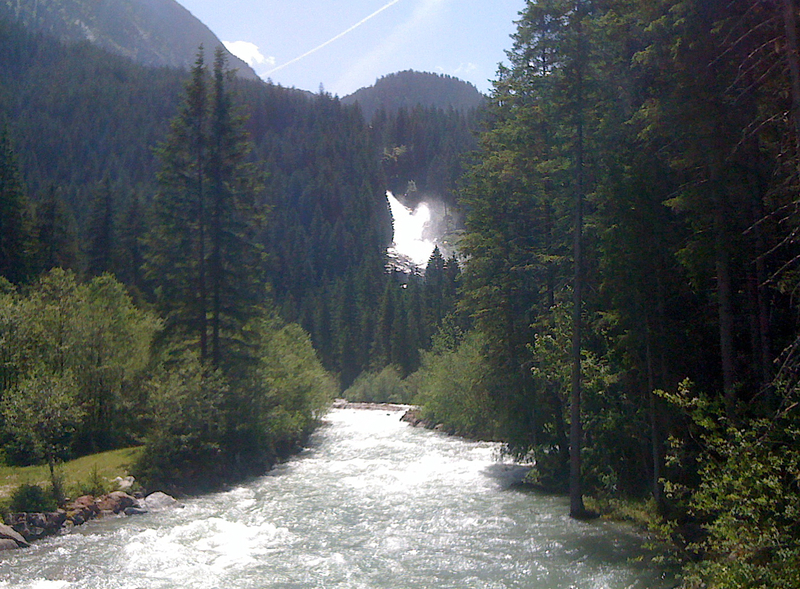 The lowest of the three Krimml waterfall cascades. 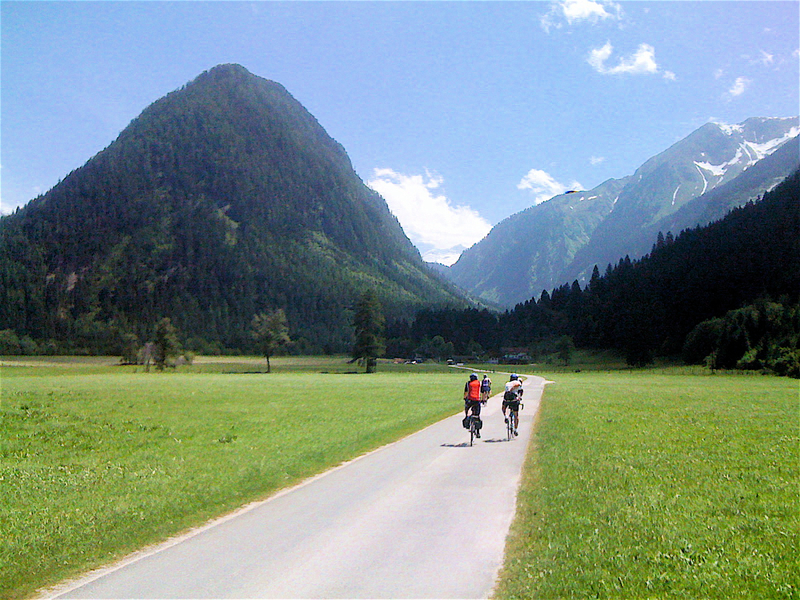 Salzach river valley – bike path leads through some spectacular scenery. 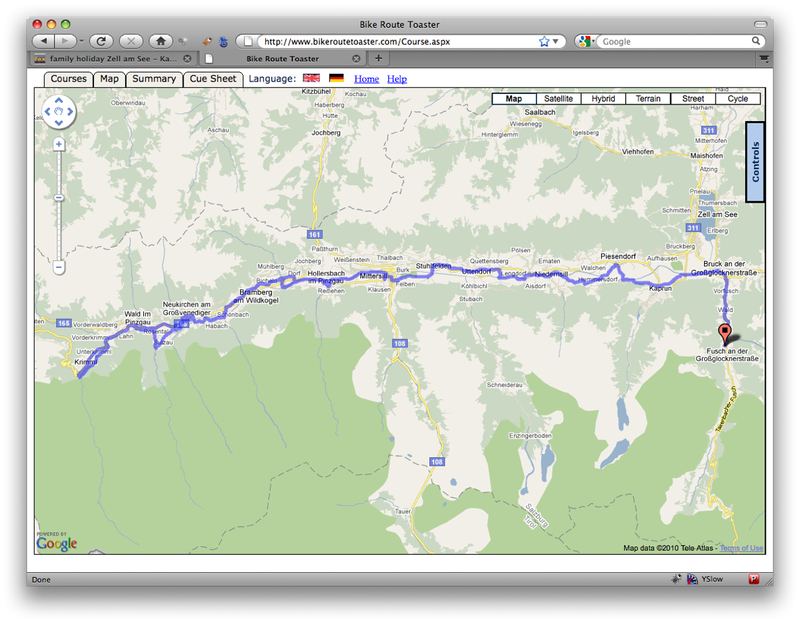 For the last biking day of my vacation I made a plan to try again the ride up to the KFJH. The forecast looked good for most of the day (there was a possibility for a rain starting at 3 pm)- sunny, temperature high enough up “there” to make the trip actually a pleasant experience (+13 degrees Celsius at 7am) and wind speed about 10 km/h – a nice breeze really. I took off at 6 am – alone this time, to avoid having to wait for folks. The ride started nicely with the toll gate closed there were no cars and no motorbikes, just couple of early cyclists and a herd of cows walking on the road heading for greener pasture higher up in he valley. Unfortunately the idill did not last long. 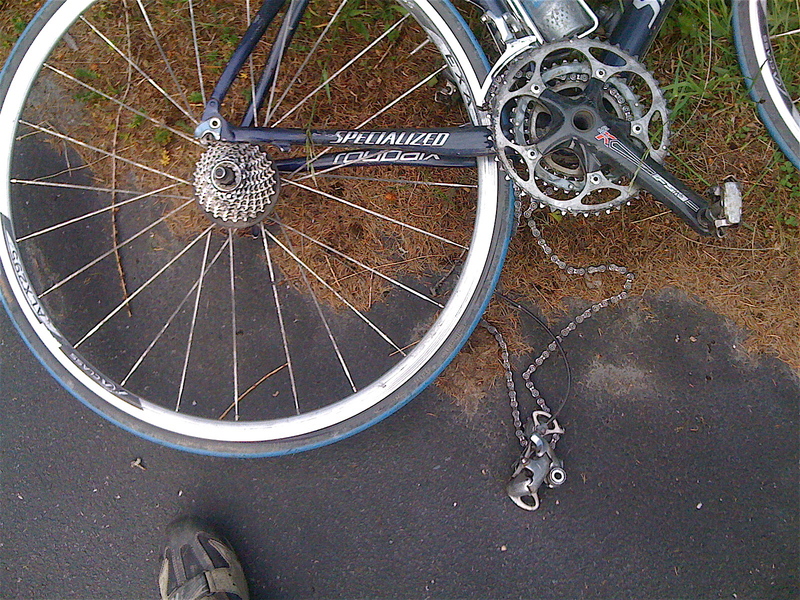 About 2 km above the toll gate, during shifting, the rear derailleur collided with the spikes and broke off the frame. There was nothing to do, just to coast back down to the village. Fortunately it is downhill all the way from there so I was back pretty quick (made only about 10 km and elevation gain of about 500m). Even my second attempt to do the trip was unsuccessful. My colleagues were up by the time I arrived, happily reporting that they ate my breakfast – which I did not hold against them of course :-). As there were various groups planning to do different things that day I was trying to decide how to spend the rest of the day. 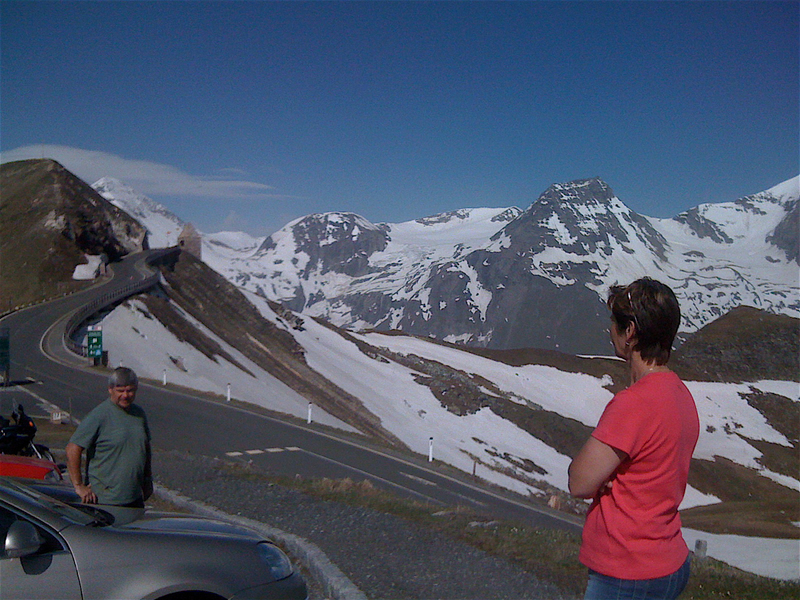 One group planned to drive by car and without bicycles up to the KFJH, so I joined them as I really wanted to see the glacier and Grossglockner. 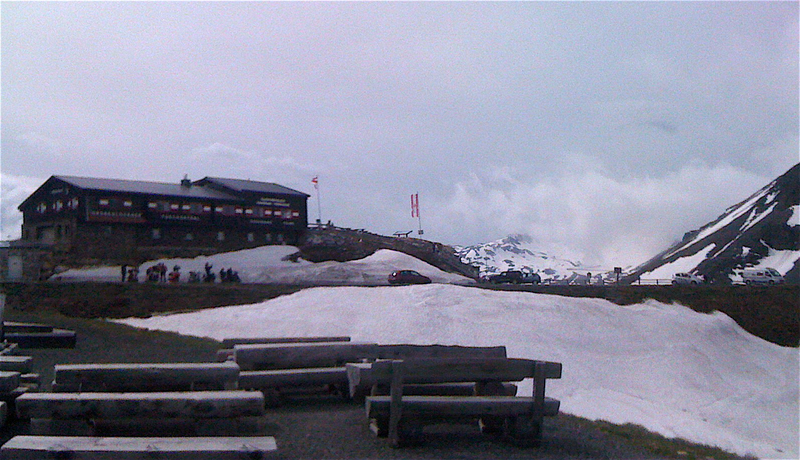 We drove up to Fuscher Torl and from there to KFJH. The weather was indeed great. 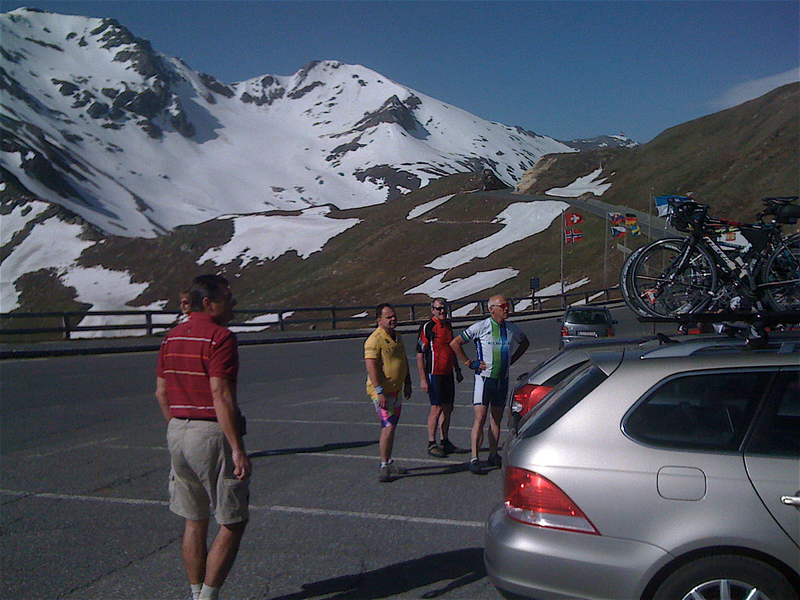 Members of my cycling group up in the Fuscher pass. 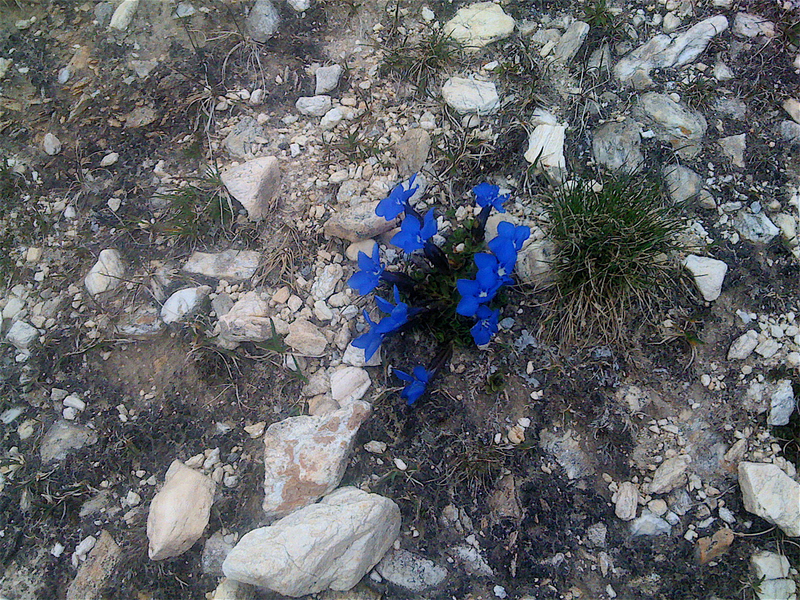 Gentiana flowers growing on the road side. 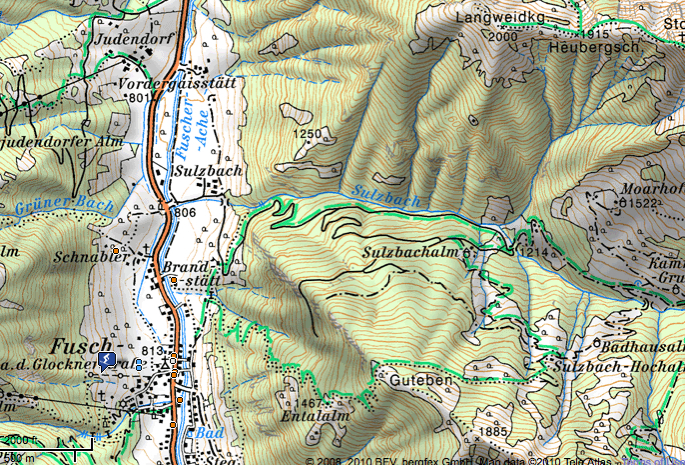 After returning from the KFJH I had lunch and around 2 pm took off for a hiking trip up the Sulzbach valley. 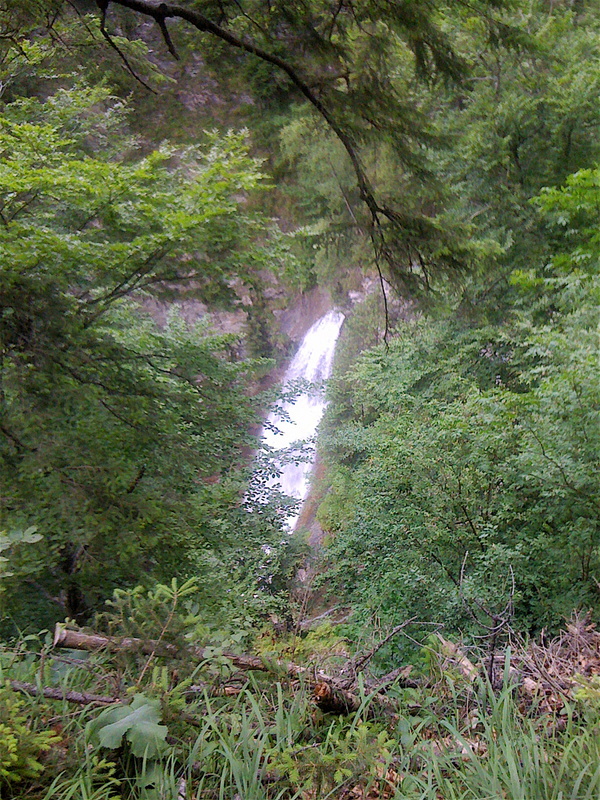 Couple of days earlier during my walk down to the town of Bruck (where I went to buy some food) I noticed a nice-looking waterfall at the mouth of the valley and now was a good time to check it out. 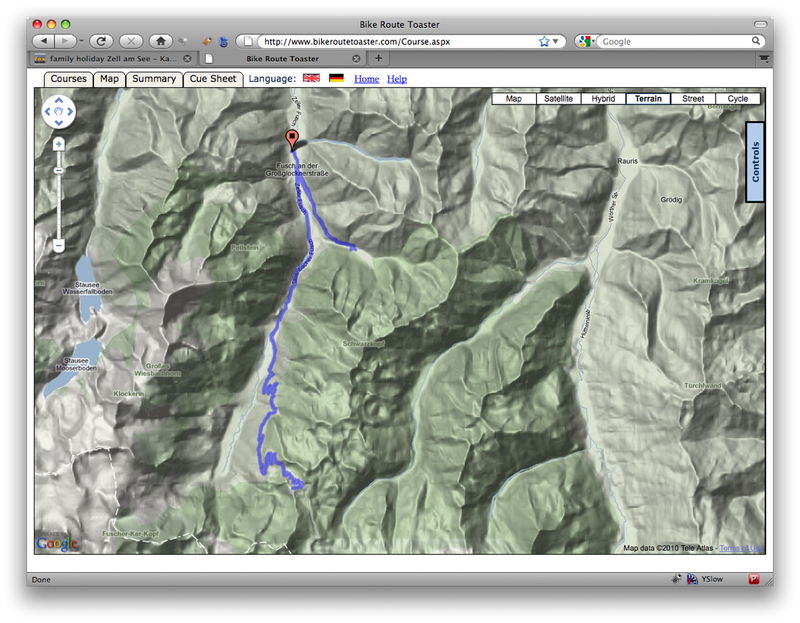 The map indicated I could do about a 15 km loop on logging roads that run right next to the waterfall. 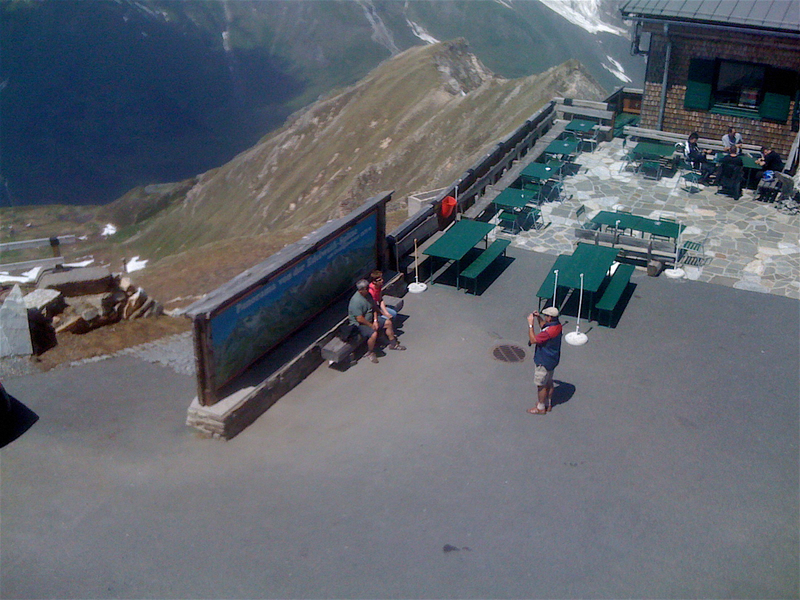 The weather was still warm and nice, but there were clouds approaching from the Grossglockner side (southwest). 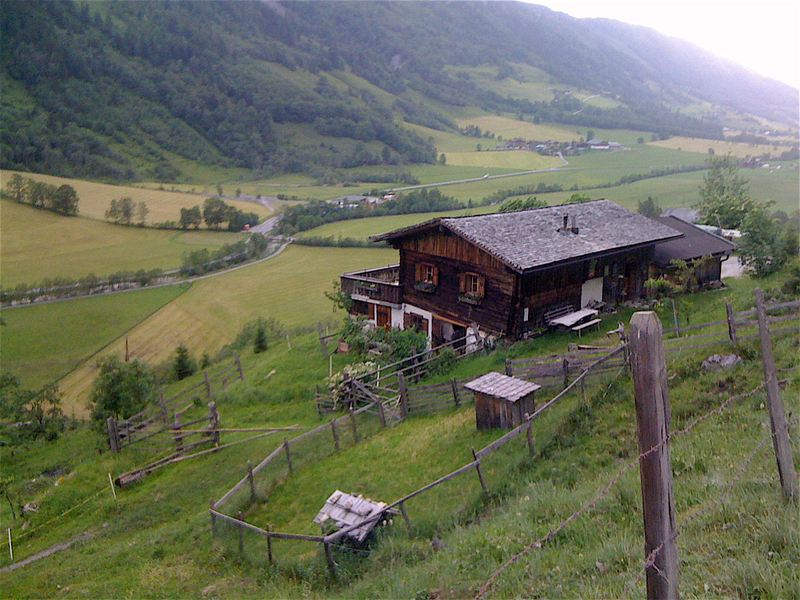 I made it to the highest point of my hike right next to the typical austrian mountain dwelling – Sulzbach alm – where a drizzle started to fall that would come and go. By the time I was about 1.5 km from the pension there was a downpour of rain. I noticed the couple I met on my way up – they were taking off in their car. They drove about 20 meters and stopped, then backed up towards me and the driver asked if I needed a ride – a very nice gesture that I often experienced in the US. It would be unusual if it happened in Slovakia. 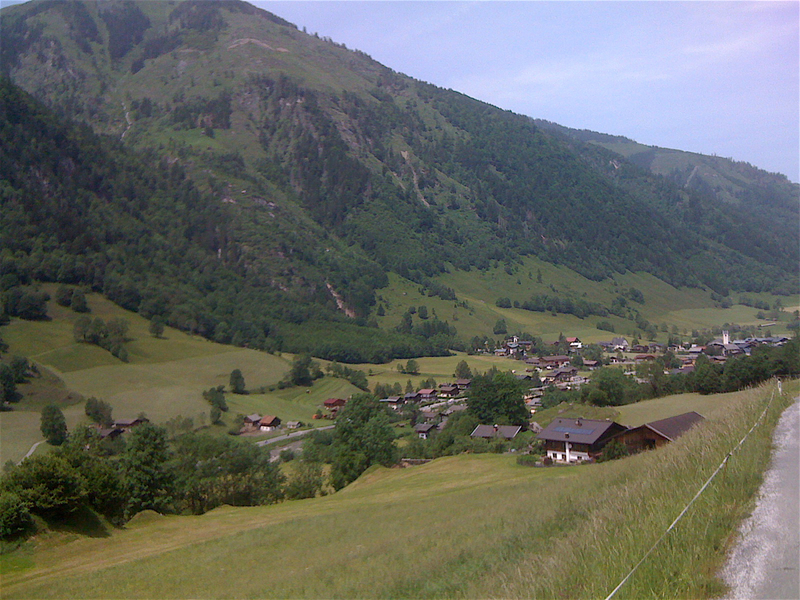 Sulzbach valley – a scene of my hiking trip. An orchid similar to the slovak species called Western Marsh-orchid, but this one had narrow leaves. 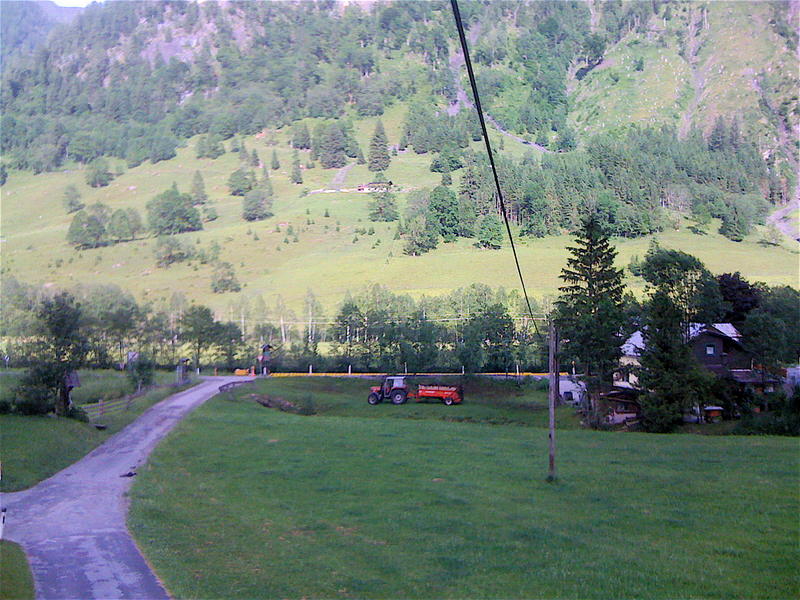 A view from our pension – note the manure-spreading tractor. The whole time we biked around this corner of Austria one could smell the fragrant drying hay as well as cow dung and manure the farmers spread on the fields and meadows. Very bucolic. This entry was posted in hiking, outdoor, road-biking, travel. Bookmark the permalink.